In an era where people are “playing” laptops and MPCs more often than ever, it’s refreshing to see some good ol’ fashioned stringed instruments hitting the stage. 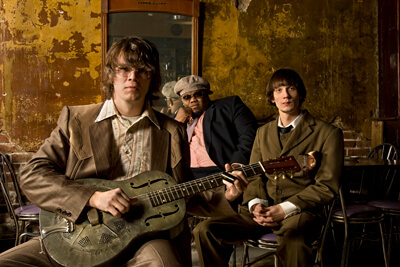 The North Mississippi Allstars have a few other tricks up their sleeves. Drummer/keyboardist Cody Dickinson plays the electric washboard while brother, guitarist/vocalist Luther Dickinson plays a cigar box guitar called a lowebow. Throw in bassist Chris Chew and the Southern rock trio is as authentic as it gets. Mixing blues, rock and country, the boys have a unique sound that fits nicely into the jam band category. Since 2000, the Grammy Award-nominated Allstars have been generating album after album culminating with this year’s Keys To The Kingdom. The record is a celebratory declaration of life in the face of death and is a welcome addition to any Americana/roots rock collection (Kyle Eustice). North Mississippi Allstars with Buffalo Killers, November 15, at Slowdown, 729 N. 15th St., 9 p.m. Tickets are $18/adv and $20/DOS. Visit www.onepercentproductions.com for more information.